Commodities seem to have found a support level after a massive selloff recently. 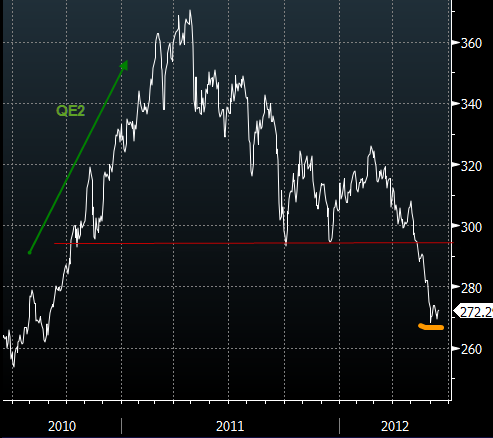 The CRB index recently broke through the previous support, correcting back to the levels of the early days of QE2. Have we now stabilized? This stabilization in the past few days seems to be driven by stories of a potential coordinated central bank action that will supposedly provide liquidity after the Greek election this weekend. Given the global slowdown, central banks seem to be the only source of support for risk assets, as global addiction to stimulus continues. Reuters: - European Central Bank President Mario Draghi said on Friday the bank was ready to support euro zone banks, should it be required, while Bank of Japan Governor Masaaki Shirakawa said central banks can offer liquidity to calm markets in case the weekend Greek elections heighten tension. But we've seen this movie before. A new action from central banks, even a coordinated one, is not expected to last long. As soon as stimulus stops, risk assets (such as commodities) begin to correct (unless another stimulus action is anticipated). Ultimately any lasting strength in the commodities markets will have to come from emerging markets growth - particularly from China. 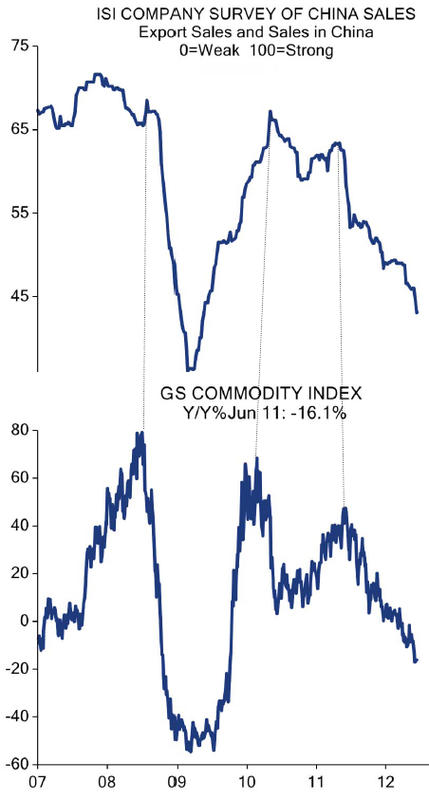 The chart below from the ISI Group shows how strong the relationship between China's corporate sales and global commodity valuations has been. Reuters: - China's annual economic growth could drop below 7 percent in the second quarter, an influential government adviser said in published remarks on Wednesday, the most pessimistic forecast of any government or private-sector economist. Sub-7 percent growth would reflect the pace of the economy during the global financial crisis. China reported economic growth of just 6.6 percent in the first quarter of 2009. Ultimately to understand the longer term trend in the commodity markets, one needs to pay far more attention to China than to central banks.